Christopher + Jeff. 2 guys truly meant to be. Christopher and Jeff met in 7th grade. In their years together, Christopher and Jeff grew together, in big ways and in smaller ways. They have weathered lots of changes, growth, challenges, push back and opportunities – and through it all, they have loved each other with fierce and beautiful hearts. With elegance, joy and heart, Christopher and Jeff married on November 13th at the Mayflower Park Hotel, surrounded by 120+ delighted family and friends. For ceremony, we had laughter, tears, important words shared by 4 friends, beautiful vows and a missing “ring dog,” Pip! Yes, Christopher and Jeff’s beloved pooch decided against ring bearer duties and instead, made an appearance at reception. 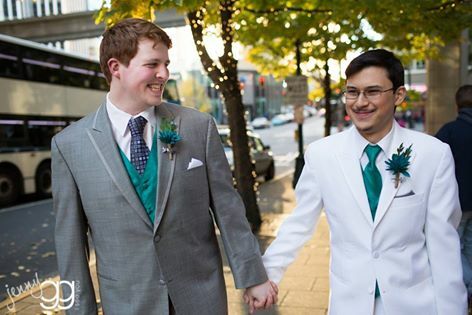 Christopher and Jeff, thank you for the happiness of being a part of your wedding day!